Who doesn’t love a good bowl of ramen? 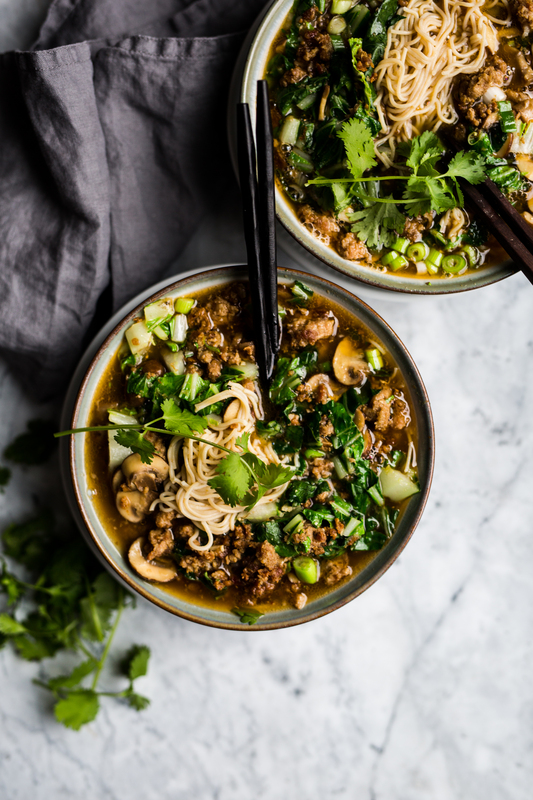 What’s even better, is a healthy bowl of gluten free ramen that you can make at home in very little time. You just need really good ingredients and you’re set. This has now become one of my favourite dishes to make on a weeknight or when I’m not feeling my best. For this recipe I’ve used a free range, hormone free pork from Sunnyside Market but you can also swap out the pork for ground chicken or turkey. The same concept for the ramen broth. Chicken stock would be great as well. I purchase the large bags of Lotus Foods noodles at Costco and I used 4 ‘pucks’ of noodles to make these two bowls. Neither M or I could finish our bowls so this would easily serve 4 smaller portions. In a large pot add the olive oil and the ground pork. Break up the pork with a wooden spoon and allow it to cook over medium heat, undisturbed until the pork browns. This step is pretty important. This is where the flavour will build. Once it brown, turn it and allow it to brown on the other side. While the pork is cooking, prepare the noodles according to the directions on the package. Set them aside once drained. Once the pork is almost all brown, stir in the mushrooms cooking for several minutes until they start to brown. Add in the garlic and ginger and cook for another minute. Pour in the coconut aminos and add in the chili paste. In another pot add the ramen broth and heat almost to a boil. Add in the white parts of the bok choy and cook for a few minutes. Add in the green bok choy leaves and the green onions. Cook for another minute. Pour this into the browned pork, mushrooms, garlic and ginger. Divide the noodles between two or three bowls. 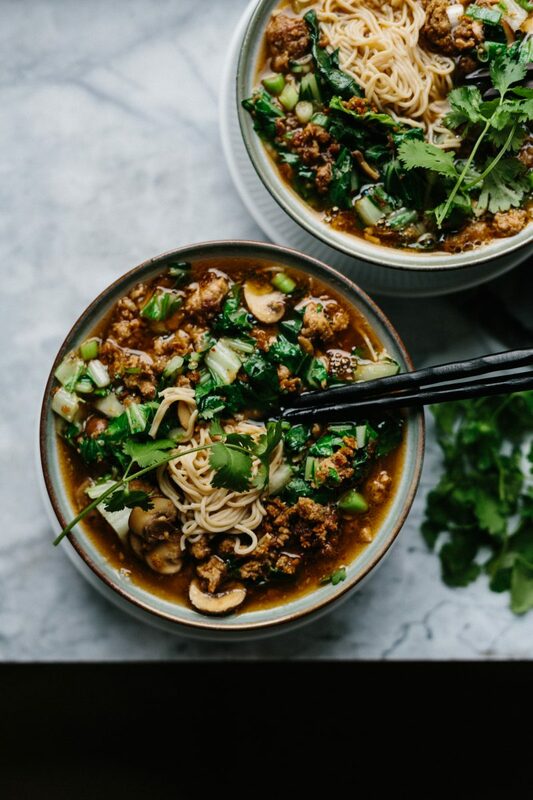 Divide the broth and pork over the noodles and garnish with cilantro. Serve with extra chili paste and green onions.